As I wrote in the last Bulletin Online column, it would be quite difficult for Russia to reduce the number of its strategic nuclear warheads below about 1500 if it is serious about completing all the development programs that are currently underway. The charts on the left (the image is clickable) illustrate this point. The assumptions behind this chart are fairly conservative. I assume 30 years lifetime for R-36MUTTH and R-36M2 missiles - this means that the former will be gone by 2014 and the latter (40 of them) - by 2022. The currently deployed UR-100NUTTH will serve a bit longer and I assume that the last of them will be decommissioned in 2018. All Topol missiles will be removed from service by 2015, which assumes their service life of about 21-22 years. The plans for Topol-M deployment announced in 2006 assumed that by the end of 2015 the Rocket Forces will have 114 Topol-M missiles. This means that the deployment rate is about 7 missiles a year - not far from what has been demonstrated so far. The main change is that starting in 2009 Topol-M missiles will be deployed with multiple warheads. I assume that the MIRVed Topol-M/RS-24 will carry three warheads, although a higher number - up to seven - seems to be possible. The 65 Topol-M missiles that have been already deployed will probably be left with a single warhead. With submarines, the assumption is that Russia will retire the Project 667BDR submarines in the next two years (if it hasn't done so already) and will keep six Project 667BDRM submarines with R-29RM Sineva missiles. The first Project 955 submarine with Bulava missiles (carrying 16 missiles with 6 warheads) will enter force in 2011. I assume that Project 667BDRM ships will be removed from service as the new Project 955 submarines enter service, so the total number of submarines will never be more than eight. As it turned out, I misinterpreted the reports about new Tu-160 production - bringing the number of these aircraft to 30 by 2020 is something that the industry is hoping for, not the actual plan. 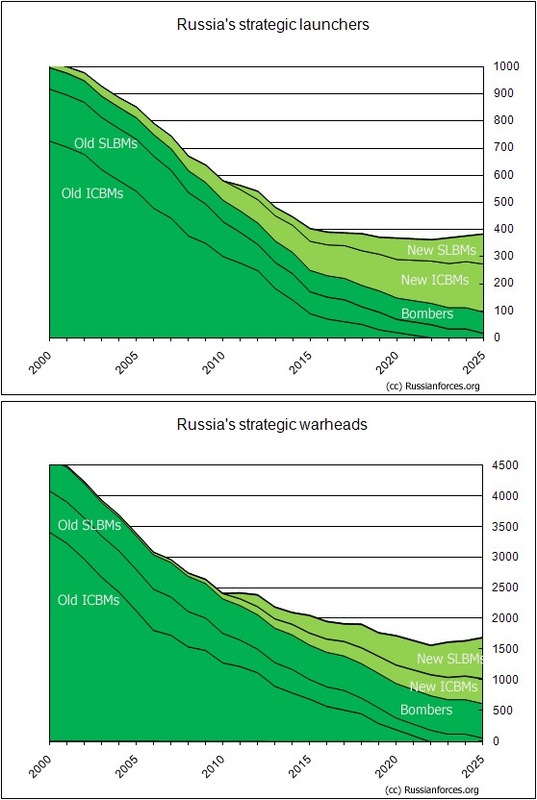 This does not change the projection, however, since the number of warheads carried by bombers still assumed to stay at the current level (it also assumes that all Tu-95MS carry 6 ALCMs). As I mentioned, these are conservative assumptions - if MIRVed Topol-M carries more than three warheads or if Russia decides to develop and deploy a new liquid-fuel missile or if Project 667BDRM submarines stay in force longer, the number of warheads will be higher than 1500. Accelerated withdrawal of old ICBMs could help somewhat, but not very much. If Russia is serious about reducing its nuclear arsenal, it would have to cut the new programs. This is unlikely to be easy. I fail to see Russia's logic in deploying the RS-24 in place of the single warhead Topol-M. One 550 KT MARV has a far better chance of penetrating US BMD systems than three ~100 KT standard Mirv's, particularly when there is no room for decoys. Higher numbers of warheads are meaningless if their chances of hitting the target are significantly lower. The only reasonable conclusion is that the 550 KT MARV warhead does not exist. It is fully logic to deploy mobile RS-24. It may be used in countervalue counterstrikes. Three 400 kt warheads (from SS-24) or six 100 kt warheads (from RSM-52) can be placed on the RS-24. Three 100 kt warheads means 600 kg payload, that's half the payload carried by the RS-24. Of course mythical "hypersonic-MARV" warhead does not exist. It is only internal propaganda fake. Also MIRV-ed Topol-M called RS-24, more Borey-class SSBNs with virtual Bulava SLBM, additional Tu-160s with next-generation ALCMs seems not possible in current situation. Russia is in deep economic crisis and State Duma Military Committee estimations clearly showed future military spendings till 2016 will drop by at least 10%. Therefore I foresee less new weapons deployment but rather acceleration of old weapons withdrawal (I think all SS-19, SS-25 and even Delta-IVs will retire until 2015!). That is why above estimations are not real. Russia will end possessing several hundred quite vulnerable warheads (Topol-Ms, several boomers and almost no strategic bombers) in 2020: simply French-Chinese "second league" level...note I do not mention state of conventional forces at all. Observer, what you just said makes no sense. Starting with the bombers, Russia has 60 or so Tu-95 bombers, all of which around 20 years newer than any US B-52, and with MUCH fewer flying hours. There are something like 16 Tu-160, all of which are virtually brand new (flight hours wise), and are undergoing refurbishment/upgrades. This leg of the triad is not going anywhere, it almost brand new, and at full load represents 600 nuclear warheads (more if external stores are used on the Tu-95). This alone is about 2x the TOTAL warhead number of any other nuclear state other than the US. The Delta4 submarines have almost all recently undergone refurbishment as well, or will do so in the very near future, and are again very new in the scheme of SSBNs. 6 Delta4 subs represent around 400 warheads as well. I cant see how you can say subs which have been refurbished just now are going to be gone in 6 years time. Now the land leg of the triad. Lets assume an annual production of 7 Topol-Ms per year (this is very conservative, likely to rise in the near future), with a lifespan of 25 years (again i think quite conservative), with 3 warheads per missile. This is approx 550 warheads. None of this includes things such as new Boreis, new Tu-160s, equipping Tu-22M3s with refueling probes and long rage cruise missiles, or increasing production of Topols, or adding the Dmitriy Donskoi to the count (it can after all carry the Bulava). You have to remember, Russia will always fund the Strategic Forces much better than the conventional forces, it has been the policy since the collapse of the SU to guarantee sufficient funding to the SRF. Also, Russia INCREASED military funding this year, has huge foreign reserves (500 billion or so), and a dead set willingness to fun the SRF. The conventional forces will be gutted before the SRF is allowed to be underfunded. Just to add to that, the Delta 4s have been overhauled in 1999, 2002, 2004, 2006, 2008, 2008, respectively. To say they'll all be out of service by 2015 is ridiculous. Interesting information on the procurement of "Topol-M" and "Yars"
As far as the strategic bomber fleet is concerned, Does Russia have any free fall nuclear bombs? Say, something comparable to the US B-83 or B-61? It is interesting to read this article (and comments) now, 7 years later.